Candidates for the contested House of Delegates seats representing Albemarle and Charlottesville shared their positions and responded to questions from the audience. The event took place at the Wednesday September 13, 2017 meeting of the Senior Statesmen of Virginia. The meeting was held at the Senior Center in Charlottesville. Following the presentation, questions were taken from the audience. The program was moderated by SSV board member Terry Cooper. SSV Board Member Terry Cooper (left), State Senator Creigh Deeds, Delegate Steve Landes and Delegate David Toscano speaking at the Senior Center in Charlottesville. The three spoke at the Wednesday May 10, 2017 meeting of the Senior Statesmen of Virginia. The meeting was held at the Senior Center in Charlottesville. Following the presentation, questions were taken from the audience. The program was moderated by SSV board member Terry Cooper. From left to right, Creigh Deeds, Steve Landes and David Toscano speaking at the Senior Center in Charlottesville. Area legislators report on the 2016 Session of the Virginia General Assembly. This was a session that included some inter-party cooperation but also the most vetoes in almost 20 years, and a post-session executive order that has spurred calls for a special session and led to a more adversarial relationship between Democratic Governor McAuliffe and the Republican General Assembly majority than perhaps ever before. Senator Creigh Deeds (D) represents the 25th Senate District which includes the cities of Buena Vista, Charlottesville, Covington, and Lexington, and the counties of Albemarle (part), Alleghany, Bath, Highland, Nelson, and Rockbridge. Delegate Steve Landes (R) represents the 25th House of Delegates District which includes portions of Albemarle, Augusta, and Rockingham Counties. 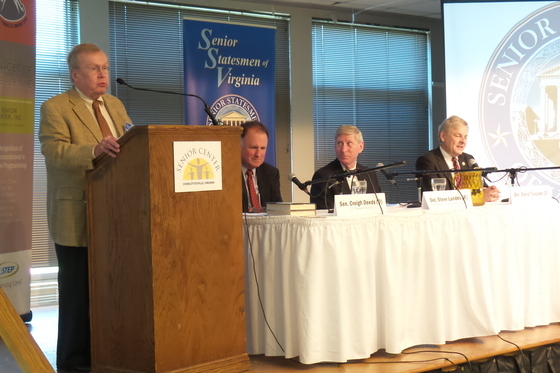 The three spoke at the Wednesday May 11, 2016 meeting of the Senior Statesmen of Virginia. 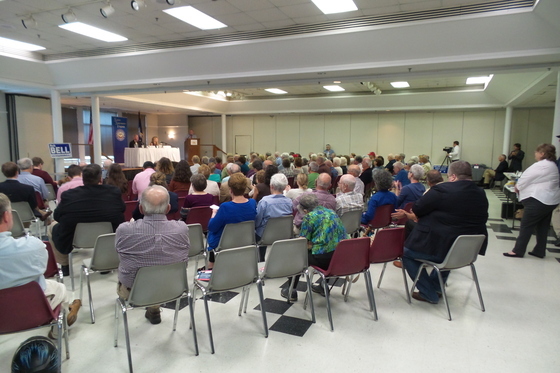 The meeting was held at the Senior Center in Charlottesville. Following the presentation, questions were taken from the audience. The program was moderated by SSV board member Terry Cooper.